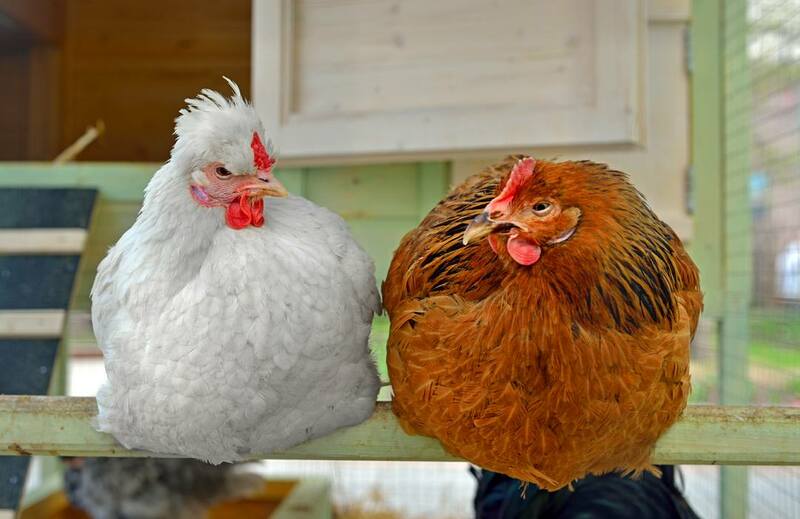 This article discusses perches or roosting bars for chickens. The words perch and roost are basically interchangeable here, meaning the same thing. In the UK we tend to use perch but in American English the word roost is more popular. What is a perch or roost? 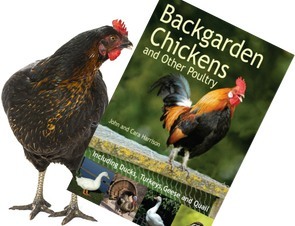 The wild ancestors of our domestic chickens were jungle fowl. They spent most of the day on the forest floor, feeding on seeds, vegetation and insects. At dusk they would fly up to the lower branches of the trees to roost (sleep) for the night out of the way of predators such as rats. So their roost or perch was a branch in a tree. Even our domesticated breeds today will do the same, left to their own devices. We, of course, prefer them to spend the night safe and warm in the coop but we need to provide artificial branches to satisfy their instinct to roost. As a general rule, you should provide a minimum of 20 cm (8 inches) length of roosting bar per hen. This may not seem much but the birds will be sat side-by-side and in cold weather they like to cuddle up to their neighbours to conserve heat. If you allow more perch length than above it will do no harm. The worst case is they don’t use it all. There are all sorts of theories regarding the size and shape of the roosting bar. Some people think you should measure the birds’ feet and adjust the width of the bar to be equal to the length of the foot. Others reckon using pipes or natural branches is the right answer. However other authorities think this puts a strain on the bird and their feet especially so a bad idea. The guideline most authorities and keepers follow is to have the roosting rod made of flat, smooth wood about 5 cm (2 inches) wide, possibly a little narrower for small bantams, with chamfered or rounded edges. Scientific research apparently backs this up. I did read an article suggesting wrapping the perching bar with rubber tape to make it softer for the hen’s feet but I really don’t see any significant benefit in this. They evolved to sit on wooden branches, after all. How High Should the Perch or Roosting Bar Be Above the Floor? Whilst the jungle fowl would fly up into the trees and roost for the night 2 or 3 metres above ground our domesticated birds generally have a higher bodyweight and are less athletic. Inside the hen house, the general rule is to place the roosting bars between 30 and 60 cm above the floor. Many, if not most, hens could reach bars placed higher but there is a risk, especially with larger birds, of them hurting themselves when jumping down. Some hen houses provide a 2 or 3 roosting bars at different heights. The favoured perches will be the higher ones and initially there may be some squabbles as to who sits where. The birds will use the lower bars as a ladder to get to the higher and down again but sometimes they will jump straight down so I don’t really like high perches. If stacking one above the other it is important to stagger them so they are not directly one above the other. Remember chickens produce 70% of their droppings whilst roosting. Do Hens Need a Perch or Roost? Perching keeps the chickens dry if the floor is damp or water gets into the house in a storm. Perching can give some protection from pests and predators by keeping the hens above floor level. Keeping the birds together at night means their droppings are more concentrated making cleaning easier. Perching keeps the birds out of any droppings on the floor which is healthier for them. It is important that the roosting bars are placed higher than any nest boxes. Chickens naturally roost high and if the nest boxes are above or at the same height they will sleep in them instead. This means the next boxes will become fouled with droppings overnight. My Hen Won’t Roost – Why Not? Sometimes instinct needs a little training to help it along. Once chicks reach around 8 weeks old and start venturing away from their mother they are ready to start roosting. You may need to help them a few times until the idea hits home. Some hens, especially ex-caged birds may never get the idea of perching. Placing them on the perch a few times may get them doing it but not always. Some birds are just plain awkward and never do, but they should be provided anyway for them!